We are constantly bombarded with breaking news on the television, Facebook updates from friends, text messages and phone calls from family, opinions on talk radio, and troublesome headlines in the newspaper. Sift through all the noise and somewhere there is a special story. A story that could be a picture book. Eileen Christelow, children's author and illustrator, states on her website that she has "file folders of clippings from newspapers, stories heard on the radio, family stories, childhood memories, conversations overheard, nursery rhymes, all waiting for me to find their beginnings, middles, and ends and to bring them alive in the space of a 32 page picture book." 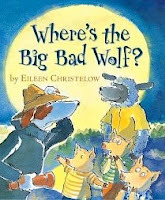 My family read the book Where's the Big Bad Wolf? this week. In this book the traditional tale of the Three Little Pigs gets a mystery style makeover. Detective Doggedly is always keeping an eye on the mischievous Big Bad Wolf. However, when trouble arises shortly after the pigs built their new homes the Big Bad Wolf is nowhere to be found. My daughter was overjoyed when she picked up on the clues in the illustrations to help solve the mystery of who was terrorizing the little pigs. The idea for this story came to Christelow after reading an article in the newspaper about local students holding fairy tale mock trials in her community. A character from a fairy tale was put on trial and the students played the roles of jurors and lawyers. She originally started writing a story about a trial, but there wasn't enough action so it turned into a mystery. To find out the story behind her other books click on the book covers at her book page. 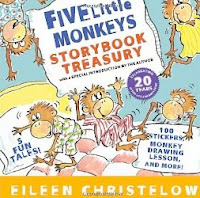 Many of you know Eileen Christelow from her Five Little Monkey Series . There are now seven books in the series (a new book to be published Fall 2011) with the latest being Five Little Monkeys Go Shopping and my son's favorite is Five Little Monkeys Sitting in a Tree (Snap!). The series started in 1989 with Five Little Monkeys Jumping on the Bed . It is often thought that Christelow wrote the 5 Little Monkeys Jumping on the Bed rhyme, however this is not true. Christelow first got the idea for the book when her daughter learned Five Little Monkeys rhyme as a jump rope chant (break out those jump ropes for a little fun!!) . As I think back to when my daughter was younger, this rhyme was one of my favorites. There is just something so fun about making a funny doctor voice to say, "NO MORE MONKEYS JUMPING ON THE BED!" A funny story about the monkey illustrations is that when Christelow's daughter was very young, she had a stuffed monkey named Alice that helped inspire the design of the monkeys. Five Little Monkeys Bake a Birthday Cake is perfect for this week. 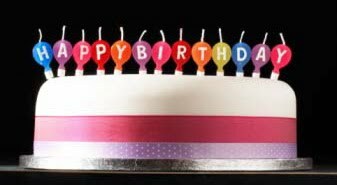 Many people have mentioned to me that they love my blog for the simple reason that it is an excuse to have birthday cake. However, after reading this book - let your kids help you bake the cake, because if the Five Little Monkeys help it will be quite a mess! Eileen Christelow shares her birthday with Earth Day. We will be bombarded with green tips and techniques this week from the media. Recycle your plastics, use a reusable coffee mug, replace lightbulbs with energy efficient alternatives, compost your table scraps.... There is probably a special story for a picture book in all these ideas, maybe Five Little Monkeys Go Green! Don't forget your Library Checklist this week. If you have any feedback on the printable, please post a comment. Check out 2 other books by Eileen Christelow What Do Authors Do? and What Do Illustrators Do? . They were very informative about how a books are developed. 4. Five Little Monkeys was a popular Jump Rope Rhyme - Check Out More! This post was updated on April 19, 2011. I am visiting from UBP After Party! I am so glad I stopped by...our family has a "book sickness" I like to call it. Except it's a good thing! My children devour books and have a real love for reading. Since I am homeschool mom I LOVE that I can foster that LOVE with good quality books. I am going be your newest follower! Thanks for what your blog represents. Feel free to come visit us anytime at THE GAERTEGANG! I have not had enough blog time lately...So glad that I stopped by..Be sure and stop by main blog and read about a miracle.